About a month ago I visited my friend Debby at her place in the east village. In one of her may lifetimes she was a pastry chef. When I got to her place she had just finished making some vodka infused with Apricot Noyau. What, you may ask (I certainly did) is that? Noyau is the french word for stone or pit. Apricots are part of the Prunus family as are peaches, cherries, nectarines and Almonds. When you crack open the pit of an apricot you find an inner core or seed that looks very much like an almond. Not only does it look like an almond it has an other worldly ethereal scent that smells exactly like really amazing almond extract. This is a very simple ice cream, rich and redolent of the flavor of Almond. Leslie Shere’s recipe says you can use either 40 or 50 cherry pits or 20 apricot pits. Unless you are on Meth and really OCD I can’t imagine how much time it would take pit and then crack open 50 cherry pits! Next time I make this I look forward to swapping out the Amaretto for Deb’s Noyau infused vodka. Break open 20 apricot pits and extract the almond like kernel within. A nut cracker makes this a relatively easy task, other wise a tea towel and a hammer would do in a pinch. 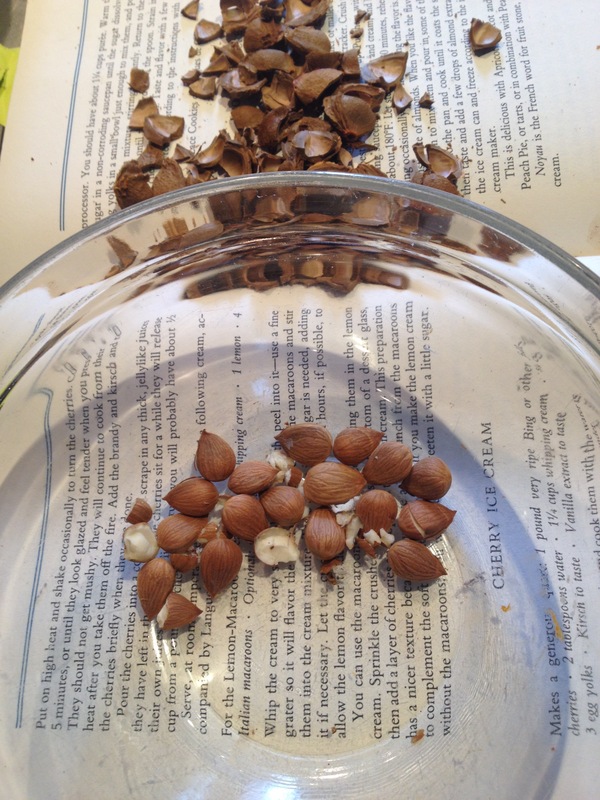 Place the kernel’s in a mortar and pestle and crush them well. In a medium saucepan add the kernels to: 3/4cup sugar, 3/4 cup whole milk (I used half and half with no adverse affect) and 2 1/4 cups of heavy cream. Over medium heat bring the mixture just before it’s about to simmer (180F) then remove from the heat, cover and let sit for at least 30 minutes longer if you want a stronger flavor. Taste frequently. In a small bowl whisk 4 large egg yolks. When the cream/noyau mixture has reached the desirable flavor, strain out the kernels and return to the pan. Heat until hot, but not boiling then little by little whisk into the egg yolks, return to the pan and cook, stirring constantly until the custard has thickened and coats the back of the spoon. In a bowl, placed in an ice bath, strain the custard through fine mesh sieve. Stir in 1 Tablespoon of Amaretto or a Teaspoon of Almond extract. Chill thoroughly and freeze according to your ice cream makers instructions. Goes great with Sour Cherry Pie, Apricot tart, or Chocolate Brownies. This entry was posted in Recipes and tagged apricot pits, apricots, Ice Cream, leslie remolif shere, Noyau Ice Cream. Bookmark the permalink.